After I made her new boots, Avery was very grateful, but explained that she really, really, needed a new backpack before school starts next week. She is such a sweet girl, always works hard in school, and gets good grades. Considering that, that I got right to work! 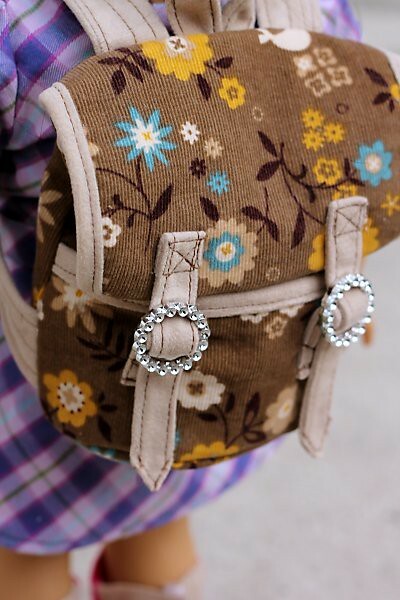 I made Avery’s backpack with baby wale corduroy with microsuede trim and straps. If your American Girl (or any other 18″ doll / similar scale) needs a new backpack, good news! I will be posting the free pattern and tutorial very soon! When you click this link, the pattern should open in your web browser, but (this is important) when I printed the pattern directly from my browser, it printed smaller then actual scale. In order to print the pattern at the correct size, be sure to download the pattern to your computer, open from a pdf viewer (I use Adobe Acrobat, which is free), and print from there. Be sure to choose the option for “Actual Size” when printing. To double check sizing, measure the 1 inch box printed on the pattern. If it measures 1 inch, you’ve got the right size! Before I publish a tutorial, I want to try it out in a different fabric or two. I also want to scout out the sliders I used for the straps. I’ve had these in my stash for at least a year and I need to check the current availability. I will make a variation in the pattern that doesn’t use sliders, in case they are hard to come by. Let me know when the tutorial and sew-along are ready! What do you think? Is Avery going to be the most stylish girl in the sixth grade? This entry was posted in Doll Sewing, Free Doll Patterns and Tutorials and tagged 18" Dolls, American Girl Dolls, Free Doll Pattern, Sewing for Dolls. Thank you! I hope the sliders are still available, I should have bought several packages! That is darling! I cannot even imagine sewing a backpack in that tiny size! But she will certainly be the best dressed in the 6th grade! Especially with those styling boots! Very cute pattern! I mentioned you in my blog. Love your pattern and your blog.